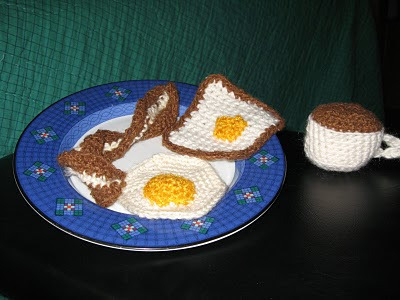 For some reason, I got it in my head that the Easter bunny should deliver a hearty breakfast instead of chocolate, peeps and jelly beans, so I decided to create some crocheted delights small enough to stuff into plastic eggs. For the egg, I simply crocheted a round and increased my stitches until it was egg size. I did the yolk the same way, but added a little stuffing before sewing onto the white. I made the bacon crinkly by slipping a stitch instead of single crochet every 5 stitches or so, every other row. To make the coffee cup, I started with a round of 6 stitches and then steadily increased until it was the width that I wanted. I did one row in the front loop only to make the cup go up. I kept going until I got the height. The coffee itself is made the same way as the egg. I use stuffing to make it look like a full cup. The toast is a square with brown stitched around the outside. The butter pat is a square also. Maybe I'll make some orange marmalade next time.